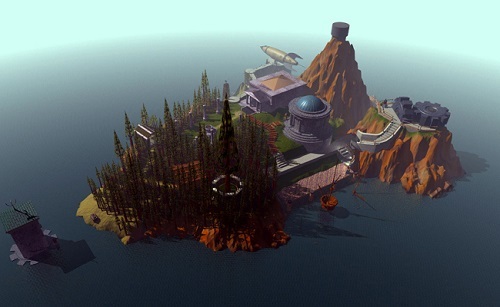 For this week’s PopMatter’s column I look back 21 years to the original CD-ROM game: Myst. The opening sentence of that piece was the main thought running through my head during my recent playthrough of the 1993 adventure game. “Myst is a lot smaller than I remember.” I realize that time takes a toll on memory and we look back on things with rose tinted glasses. But it wasn’t a difference in the measure of quality I was taken aback by, but the size of the game world. I haven’t written a piece like this one in a long while, where I take a basic thought and see where the my brain takes me. Most posts need the argument spelled out before one starts writing. Here it comes as one types. I had no idea where exploration of my own thoughts was going to take me, what conclusions I would arrive at. These types of posts are the fastest to write, but the hardest to do. The actually writing took a little under an hour to complete. But the idea for it had been festering unconsciously in the back of my mind for several weeks by that point. I had only noted an observation and as the post went on I worked out an explanation.